The following article was originally published in the “Michigan Catholic” newspaper on May 17, 2018. Clinton Township — It’s a scene all too common in families across our country and city. A family member suffers silently. Moods change, and behaviors grow different. People become distant, often without warning and seemingly without reason. People act out, and no one seems to know why. The World Health Organization estimates one in four people will be affected by mental illness at some point in life, and it’s not uncommon for leaders to decry the lack of “mental health” resources available to the public at large. But while it’s easy to say those with mental health crises should “seek help,” what exactly “help” looks like isn’t always an easy answer. Andrea Foley is the chief program officer for Catholic Charites of Southeast Michigan’s behavioral health counseling program. The program has seven outpatient mental health clinics in Monroe, Oakland, Macomb, Lapeer and St. Clair counties. Court systems and state service agencies often refer to the organization, which is one of the few mental health providers who accept Medicaid. “We provide individual one-on-one sessions or group therapy, as well at marital and family therapy,” Foley told The Michigan Catholic in an interview about the state of mental health awareness in the area. “Our clinics give preferential treatment to the poor and low-income families that have Medicaid, because with mental health treatment, Medicaid doesn’t pay as well and there are a lot of providers who don’t want to service that population,” Foley said. 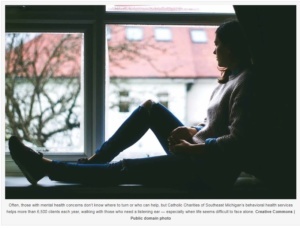 Catholic Charities of Southeast Michigan has been involved in mental health care for 60 years, providing master’s-level licensed therapists to accompany those who need someone to talk to. Foley said Catholic Charities serves an estimated 6,500 patients a year, filling a gap in mental health care that other charities or health care providers don’t reach. Despite being imbedded in the community for such a long time, Foley said Catholic Charities staff still fights the social stigmas associated with mental health awareness that often impedes people from seeking treatment. Kirsti Reeve has been a therapist and clinical supervisor at Catholic Charities since 2009, seeing clients in Royal Oak and Waterford. She specializes in helping teens and young people who have violent thoughts or are dealing with substance-abuse issues. Everyone time someone walks into her brightly lit office, they are taken aback by how normal it looks, Reeve said. Just as people who have a cold or the flu need to see a doctor, Reeve said people who feel more reclusive or unsure of themselves need to take advantage of the mental health services available to the community. The stigma of mental health traces a long history, and more recent history hasn’t always been kind. Before advances in medicine led to discoveries of drugs that treat psychosis and mental illness in the 1950s, the usual course of action would be to place mentally ill people into state-sponsored asylums. In 1963, President John F. Kennedy signed the Community and Mental Health Act, which called for the creation of community mental health centers to stop the institutionalization of those with mental illnesses, allowing them to get the treatment they needed within the community. Despite this, the program never received full funding, Foley said, and when it comes to cutting government programs, mental health seems to be a favorite. On Feb. 21, Reeve gave a presentation at Sacred Heart Major Seminary in Detroit on how parishes and pastors can play in role in fighting the mental health crisis in the community. Reeve said an important first step can be having a friend, family member or even pastor speak to a person suffering from mental illness and ask whether they need help. Just like Catholic Charities is there for people with mental health difficulties, the organization also offers support to families, friends and priests in accompanying those in need of help. When a person comes in for therapy for the first time, or comes back for repeat visits because they found someone who is easy to talk to and supportive in their most vulnerable moments, one can see the burdens of life ease, Foley said. Catholics are called to look after the needs of those closest to them — even when it comes to topics that are uncomfortable to address. But the fact that the Catholic Charities is the largest provider of mental health services in the state goes hand in hand with the Church’s mission: being there for others. May has been observed as Mental Health Awareness Month since 1949. May 15 is the feast of St. Dymphna, patron saint of mental disorders, neurological disorders, depression and anxiety. If you or someone you love needs to talk to someone, call Catholic Charities of Southeast Michigan’s behavioral health counseling at (855) 882-2736 to schedule an appointment today.